Learn how to make video games for a living. Train at our school in Vancouver – Canada’s hottest market for video game developers – and transform your passion into a lifelong career. Fill out the Request Info form above to learn more about the program – or apply today! The Game Development & Design program at VCAD will give you the solid foundation in the technical and artistic skills needed to become a part of this growing industry. You'll learn the key of storytelling, game design, game play, modeling, and animation techniques. Students acquire a solid foundation in traditional artistic techniques as well. From color theory, design fundamentals to life drawing, you will apply this knowledge to the production and animation of characters, lighting, texturing, layout and design. Upon graduation, you will be prepared for work in a variety of CGI based industries like computer animation studios, game development companies, post production and special effects studios. Where an applicant’s first language is other than English, and s/he has not completed his/her secondary (or higher) education in English, the applicant will be required to pass the College’s admission test. The program consists of six 12-week terms. Most courses are worth three credits. 90 credits are required to complete this diploma program. For those interested in pursuing a specialization in mobile game design, visit our Mobile Game Design and Development program page. This course is an introductory level course that prepares the student to draw anatomically correct structures of the human body. Students will learn to draw the human figure in correct anatomic detail based on the observation of live models. This course will emphasize the anatomically correct proportions of the human body and the accurate portrayal of muscles and other landmarks by applying various techniques of shading and lighting, views and perspective. In this course, students will be learning the basic principles of animation. Students will participate in several practical projects designed to illustrate the fundamental processes of animation. The course will explore the traditional techniques of animation and how they apply in the modern world of computer generated animations. The course will explore the different types of animation including stop-motion, visual effects, traditional animation and CG. Game theory covers the current trends of the industry along with design principles and process of the development of large and small games. Current trends and technology will also be discussed along with the technical aspects of the gaming industry. Industry position and roles will be covered along with the differences between individual developers. Game types and titles will be explored using with web resources. This is an intensive introduction to the complexities of working in a 3D application. The first portion of the class will focus primarily on the tools in Maya with navigation and the interface as a key element. Students will learn through simple and intermediate projects how to work in 3D. Time will then be spent introducing modeling in both nurbs and polygons. Students will then cover simple unwrapping procedures while learning about the complexities of UVs. Basic lighting tools will be covered to ensure that the projects developed in this term can be presented in a professional manner. This course is dedicated in large part to the drawing and representation of the skeletal structure and musculature of the human body. Students will learn the anatomical names of the skeletal elements, landmarks and muscle groups. Students will learn how to draw the structures of the human skeleton and then add the surface muscle groups and features appropriate to the skeletal sub-structure. The course will also explore the differences in the portrayal of male and female musculoskeletal features. Students will also be introduced to the drawing of animal forms and basic animal surface coverings. This course explores the design and production of characters for the animation and video game industry. Students will learn the principles of good character design, from research to final detailing, while focusing on character development, style, and personality. Students will apply principles and techniques of design and anatomy to achieve the expressive, well-developed, appealing characters. By the end of this course, students should be able to work with a variety of styles, archetypes and body structures to construct their characters. This course introduces students to concept of storyboarding. Students will learn how to create clear, concise storyboards as well as how their art is used in a game development process. This course will explore the basic game design process and how the art is integrated. Student will discover the elements that go into the production of final production storyboards and how these are used in the game design process. The key focus of this course is being able to think like a character modeler Simple characters will be lit, unwrapped and textured to ensure that existing designs are accurately presented. Professional design methods will be followed. Assignments and designs will be pre determined to ensure efficiency and the understanding of the techniques and process. This course explores the design and development of 3D environmental modeling. Students will learn how to observe real world environments and then translate their observations into producing interior and exterior environments. Students will also learn to consider staging and environmental mood into the design and structure of the environment. Topical coverage includes effective environment design, interior environments, exterior environments, creating illusions of depth, matte painting (fundamentals) camera action and displacement prop, effects, and strategies for creating mood and atmosphere. In this course students explore the planning stages of a game. Student will use non-digital and digital methods to develop different concepts that are dynamic and engaging. Students will work in teams to discuss and plan these concepts. There will be group presentations and analysis of these projects to explore their viability and game play. Students will also spend time in this course analyzing both traditional board games and digital games through the last 50 years to discuss and consider what works in each title. This course will explore the basic techniques of 3D animation. Using industry standard software students will take their first steps to animating a basic character. Using a hands on approach, students will learn the techniques of basic animation. Topical coverage includes animation software tools and functions, key framing, modifiers, basic morphing techniques and linear and non-linear animation. This course is an introductory level course in texturing and lighting. Students will be introduced to the use of various Adobe Photoshop painting and editing tools and techniques, in conjunction with the Autodesk Maya UV and material toolset to create a wide variety of textures, ranging from basic surfaces such as wood and fabric, to photo-realistic textures based on photographs, and techniques used for texturing game and film environments. Students will also become familiar working with the hypershade and shader networks to develop aesthetically pleasing textures. The UV texture editor and its tools will be a key component to the development of material in texturing and lighting. This course explores more advanced designs and human anatomy in the development of male and female character models. Students will work with the available tools to add realism to these designs. Time is spent developing low poly models that are well built and dynamic. Students will work with pre-designed characters and real life reference material to ensure that the models are to proportion and have proper anatomy. Students will explore level design theory and techniques and develop a working level concept in using traditional methods. Students will also be encouraged to develop environments using developer tools. Design and playability will be a key to a successful final project. By the end of the term students will develop a simple working level to be presented to their classmates and instructor for review. This advanced studio course explores the design and development of 3D environmental modeling and design. Students will work with a pre developed concept and follow the required specifications and concept are to develop professional environments and then translate their research into producing dynamic environments. Students will also learn to consider staging, atmosphere and environmental mood to enhance the professional look of the environment. Topical coverage includes effective advanced environment design, composition, matte painting (fundamentals) action and strategies for creating a professional demo presentation. The final goal of this course is to explore environmental demo reel options. This course focuses on acting and intermediate animation techniques, students will improve on their skills from term one and push their timing, anticipation, follow through secondary action and cycles. Students will use live reference to enhance their animation. Time will be spent improving both technical and acting techniques to prepare the students for advanced animation and portfolio development. This course explores the advanced process of preparing the setup of a character model for advanced animation of characters. The course will take the students through the steps of character modeling and animation with a focus on the rigging of the characters. Students will learn how to prepare and setup character rigs, bind structures to geometry and work with meshes and armature. Students will learn to rig facial expressions and lip movement as well as rigging and animating armature Topical coverage includes joint orientation and preparing skeletons, rigs, inverse kinematics, facial rigging, armature, binding structures to geometry and meshes. Portfolio I is a conceptualizing and planning course for the development of the final student demo reel and portfolio. Students will discuss, create a plan and consider their options while developing designs and storyboards for their final project. The development of two pre-visual animatics will be completed along with a production proposal focusing on design, colour and composition. Time will be spent considering the timing of the final presentation and the overall aesthetic. Students will also consider a final presentation with all elements such as technical information and traditional design work. This course covers the fundamentals of interface design. Students will work primarily in Photoshop to design these elements. Raster designs will be the key element of this course however students will be introduced to vector tools. Illustrator will be discussed as vector application to asset in the development of this content. In the latter portion of the course student will be introduced to simple motion graphics to add to their interface presentations. This course is a continuation of level design 1. Students will explore advanced tools, techniques, and animation and develop a working level in the unity 3D game engine. Students will also be encouraged to conceptualize new ideas and work with content that has been developed in the environmental design class. By the end of the term students will work in teams to develop a working level to be presented to their classmates and faculty for review. Atmosphere, design and playability will be a key to a successful final project. This course introduces the student to 3D scripting using Maya Embedded Language or MEL scripting. Students will learn the various features and functions of the language that will add advanced capabilities to the animations. Students will learn how to use the MEL scripting language and its capabilities to streamline and automate the character rigging process. The course will then explore the use of MEL scripting to create a character animation. Students will develop advanced animation that will work in the real time game engines. Time will be spent analyzing real world examples and working in Maya to develop believable animations. The student will then learn how to incorporate these animated characters in game engines to ensure that the animation works in the required environment. Time will be spent analyzing the movements and revising the content to ensure that the animation is appealing and work within a game environment. The analysis of industry examples will be a key component to assist in the technical aspects and timing of this animation. In the final weeks of this course, simple effects will be introduced to discuss the aspects of particle in game engines. This course focuses on the video presentation aspects of the final demo reel. Students will work with compositing and editing tools to add the final touches to their presentations. The course will focus on small projects that will help the student understand the complexities and tools of compositing and editing and then students will create their final edit with the assistance of the portfolio and compositing and editing instructors. Students will explore the basics of digital effects animation and work with particles and effects tools with Maya. You will work with the digital tools to develop simple dynamic animations while considering effects elements to add life and atmosphere to their reels. Students will cover the basic forces and elements such as fire and water and discuss lighting mood and atmosphere created by these effects. Timing physics and design will be a key component to ensure that the effects developed in this class will have a natural look and are believable. This course builds upon the previously covered topics of lighting and textures. It takes the students beyond the basic light sources and shadows and explores lighting and texturing as an art. Students will learn advanced lighting and texturing skills and techniques and how to apply them to their final modeling and animation projects. Students will learn to select the appropriate light type for a particular situation as well as the correct material 2D and 3D textures. Topical coverage includes lighting colour and composition, Maya light types, High quality shadows and effects, Raytracing, 3D textures and projections. The emphasis of this course is to prepare the student for graduation and final portfolio development. Time is spent developing a final demo reel to showcase the strengths and talents of each student in a branded visually appealing presentation. Students will have the option to develop a demo reel that focuses on their interests and skills within the 3D industry. Time will be spent focusing on content that showcases primary skills such as animation or modeling. There will also be an opportunity to plan and showcase secondary abilities to increase the potential opportunity of employment. Planning and production pipelines will be followed and deadlines will be achieved. Students will be critical of their work and change their artistic material if necessary. 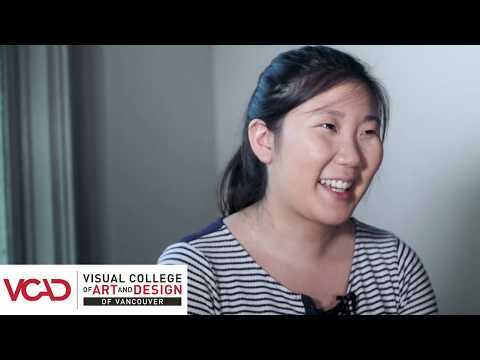 Learn how graduates became interested in studying at VCAD.